This is how Holbrook Jackson described his first visit to a small pottery dealership situated in Brownlow Street, Holborn in 1910. He was not the first, nor the last, to be captivated by the eccentric creations of the four Martin Brothers. 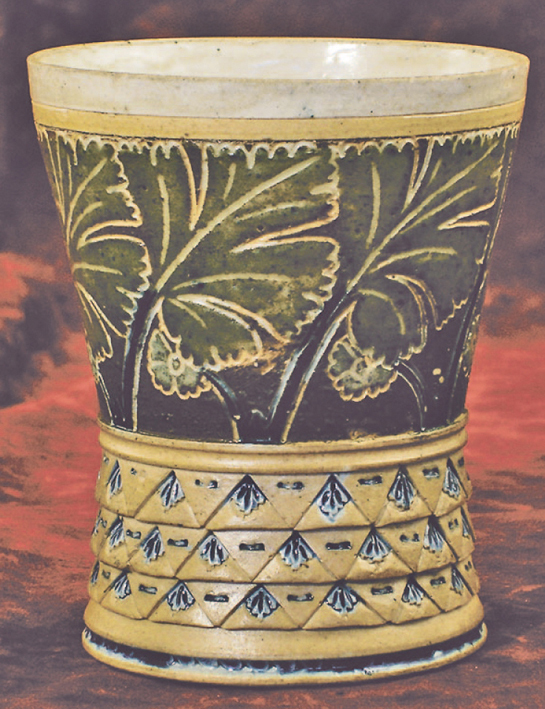 Today, Martin Brothers pottery forms a unique collecting niche and has become one of the most recognisable and interesting areas of the antiques market. The men, their birds and their beards in the workplace. 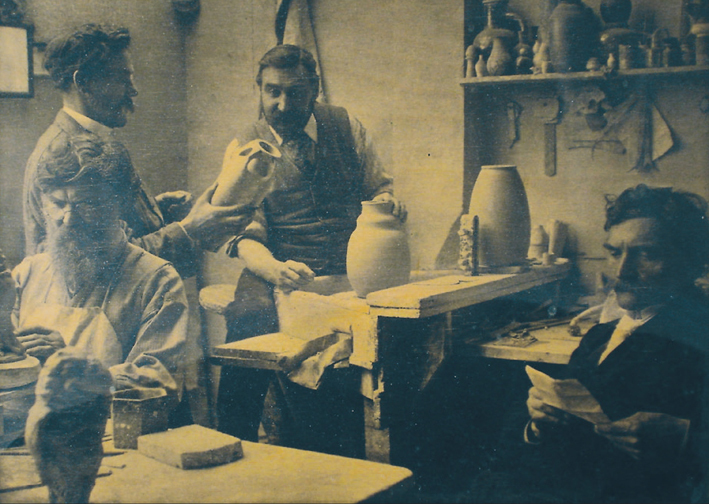 This c.1910 photograph on wood depicting (from left to right) Walter, Robert and Edwin Martin, sold for £380 at Woolley & Wallis in November 2006. Production began in 1873 with a kiln at the family home in Fulham and expanded in 1877 with a move to a disused soap works on the canal on Havelock Road in Southall, where sporadic production would continue until 1923. Eldest brother Robert Wallace modelled the figures, Walter fired the kiln, mixed the glazes and threw the pots, Edwin was chiefly the decorator while youngest brother Charles ran the City shop - badly. Wildly eccentric, even by the standards of his siblings, he hated to part with any of the wares, hid the best of them under the floorboards, and turned away many a prospective customer. Eventually, the shop burned down, the brothers lost their stock, and Charles his sanity. There was a less-than-commercial approach to production. A single high-temperature kiln was fired just once a year without protective saggars which meant every pot was in direct contact with the flames. 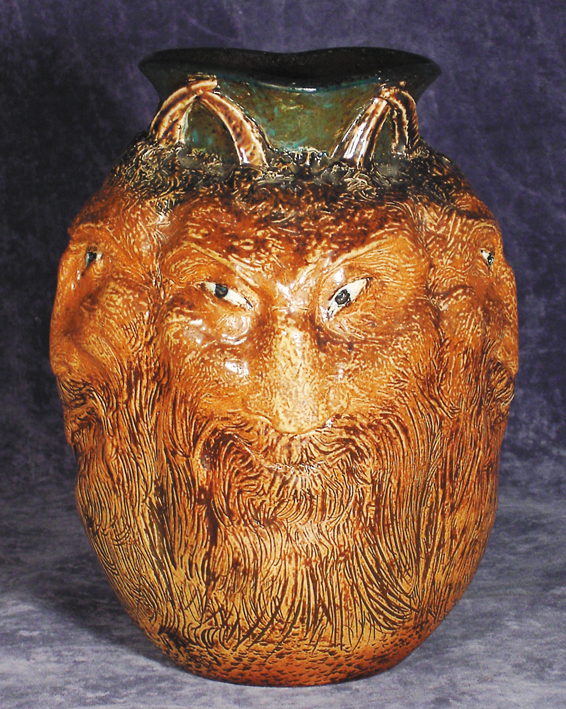 The result was a very unpredictable output - on one occasion, only one good pot emerged from an entire year's work, but the pieces that did emerge were Victorian art pottery at its best - a vast range of wares often beautifully formed and decorated, sometimes whimsical, sometimes comical, sometimes dark. Collecting studio ceramics is often associated with hunting down rare combinations of shape and colour from a documented range of products. 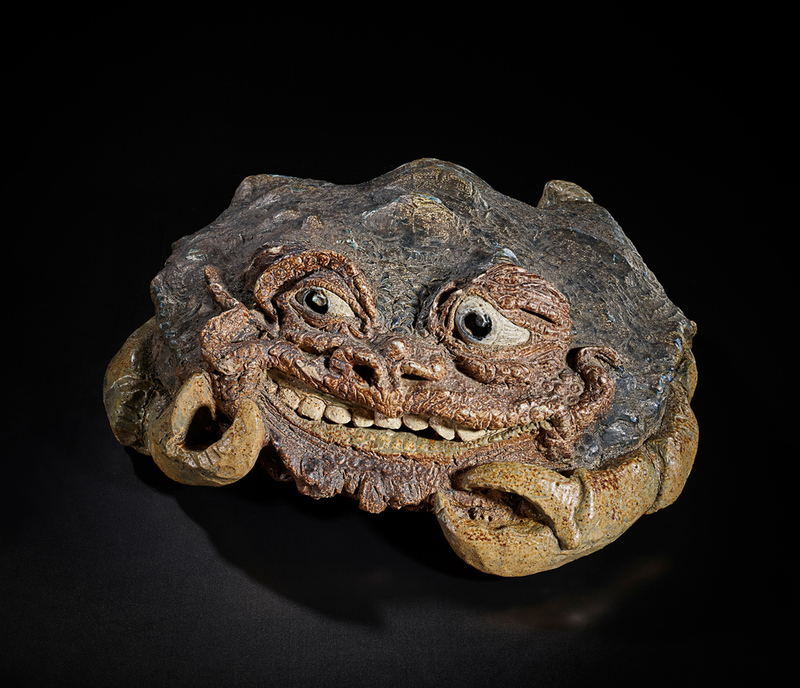 Martinware collectors are attracted by a combination of humour with menace and dreams with nightmares that cannot be separated from the extraordinary circumstances in which the pottery was created. 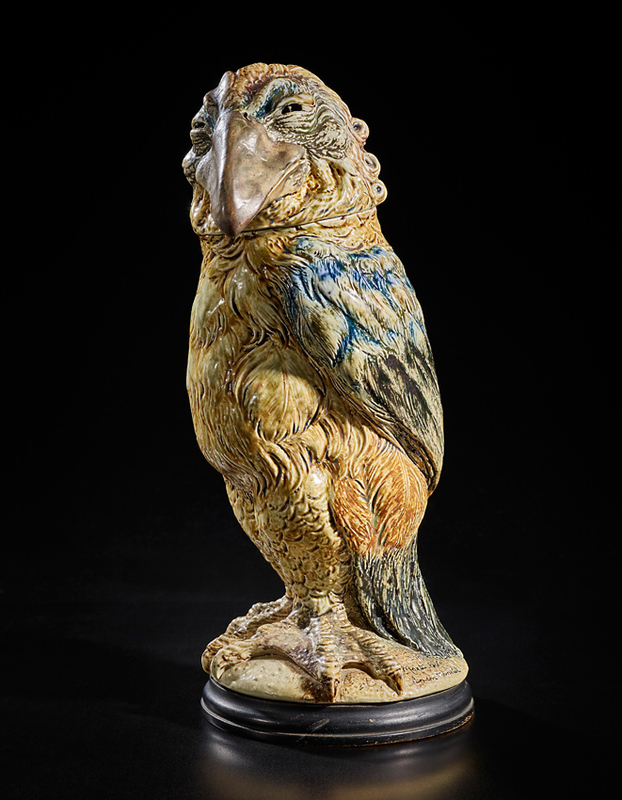 Robert Wallace's most coveted creations are his Gothic-inspired anthropomorphic bird jars, glazed in the subdued palette of browns, greens, greys and blues so distinctive of Martinware. 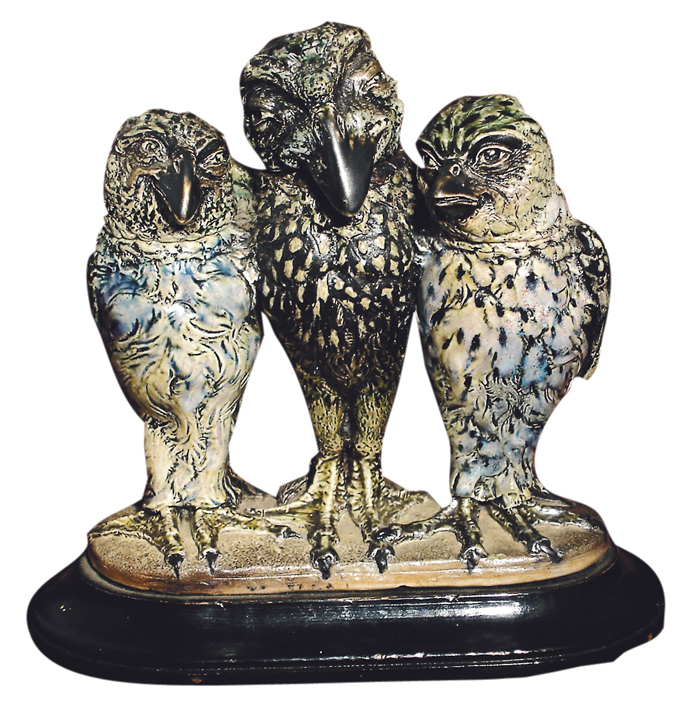 These characters from Victorian London (the earliest is dated 1880) were professional types, public figures and local waifs and strays modelled in avian form and have become iconic objects in the history of British decorative arts. But, it is not all about the birds. 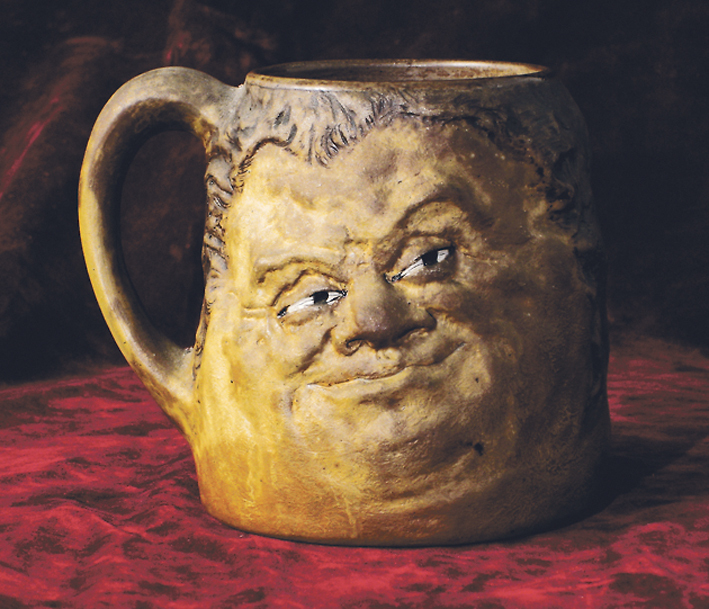 Martinware collecting can itself be split into a number of niche markets with some collectors focusing upon the less iconic but equally evocative grotesques (the face jugs, the musical imps and the wonderful spoon warmers), the thrown and incised vessels that offer the full Martinware experience at lesser price levels or the appealing range of miniatures and gourds. 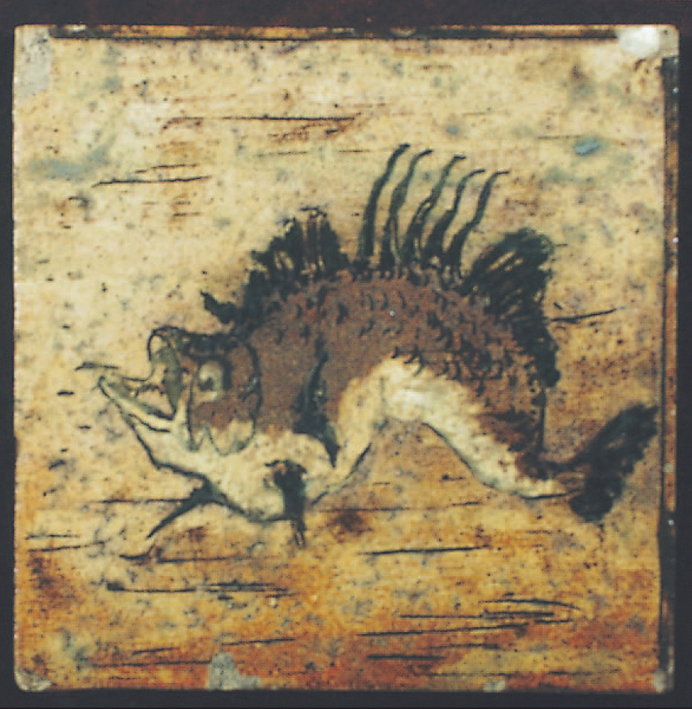 Martinware has a surprisingly long and enduring collecting history and the most engaging of these ceramic eccentricities have long been beyond the pocket of the working man. Surviving 1913 receipts list a tiny Martin bird available at 8s 6d (421/2p), with larger bird jars from 37 shillings to 55 shillings each (£1.85-£2.75). On the same receipt is a quote from a recent copy of The Times: "Someday, collectors will ransack the town for Martin's artistic stonewares." Prophetic words indeed. 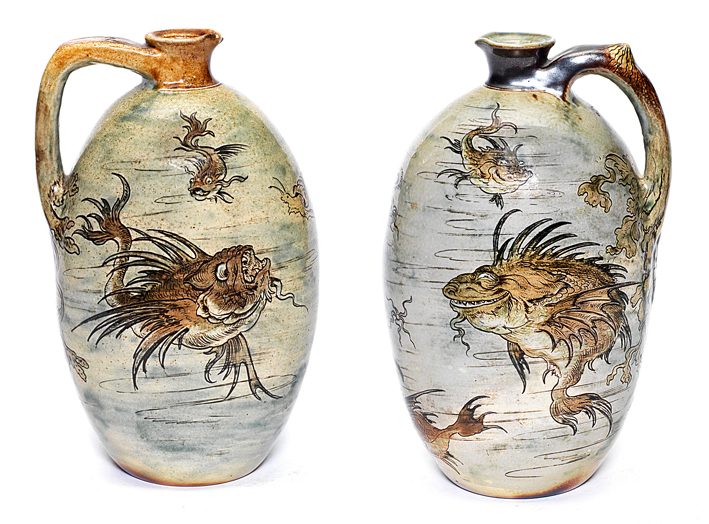 A pair of vases incised with fish, jellyfish and an eel, in shades of ochre and green on a blue ground incised '10- 1903 Martin Bros, London & Southall', 6in (15.5cm) high - £3400 at Woolley & Wallis of Salisbury on October 2005. Size, species, date, colouring and condition are all important ingredients when assessing a Martinware bird, but character is key. 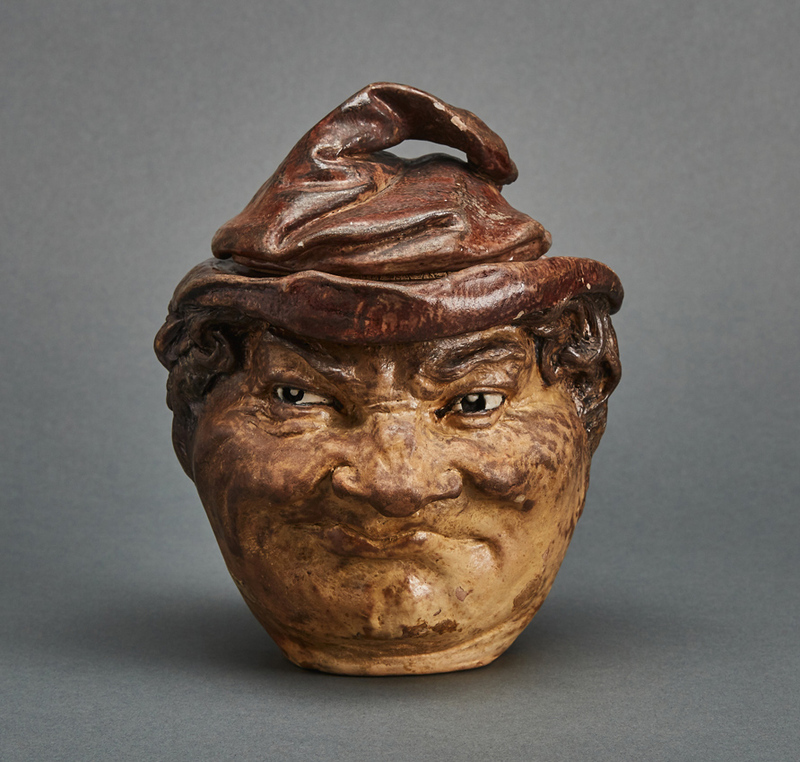 Collecting Martinware is very much a love affair and it is easy to be seduced by a mischievous wink, a knowing smile or a sly sideways glance. 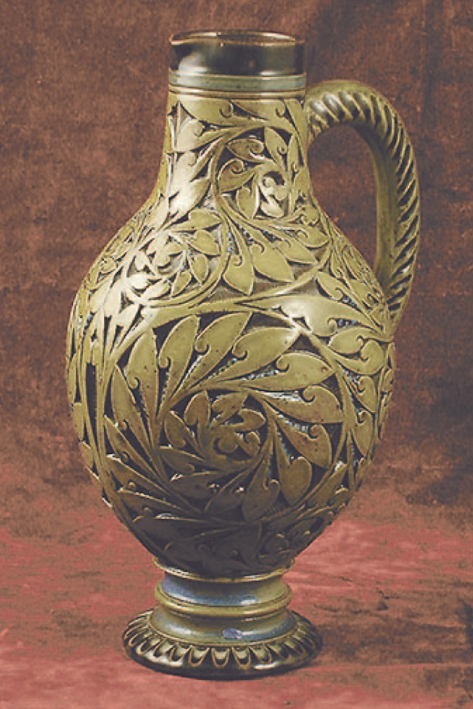 But, while there are many who covet these trophies of Victorian art pottery, they have become prohibitively expensive, with prices over £15,000 now commonplace (although damaged examples make less). In the early 2000s, Michael Jeffery, decorative arts specialist at Salisbury auctioneers Woolley & Wallis negotiated the private sale of two large birds of 1896 aping the Victorian politicians Gladstone and Disraeli for a record £150,000. He estimates that there are perhaps up to 20 collectors worldwide for whom owning a menagerie of Martin birds is both a desirable and financially feasible pursuit. Accordingly there tends to be much more action at more affordable price levels. Increasingly the focus is upon the mid-price ranges (including the grotesque spoon-warmers, the two-sided face jugs, vessels incised with birds and fish) and the pieces that provide the entry level for new collectors from £150 upwards. 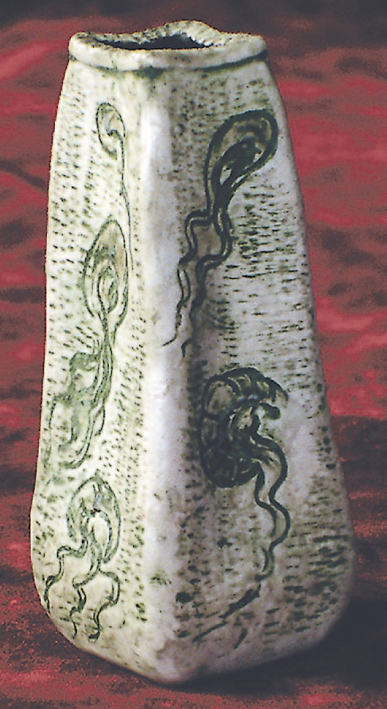 Gourds, both full-size and miniature are a collecting field in their own right with the best examples capable of springing four-figure sums. 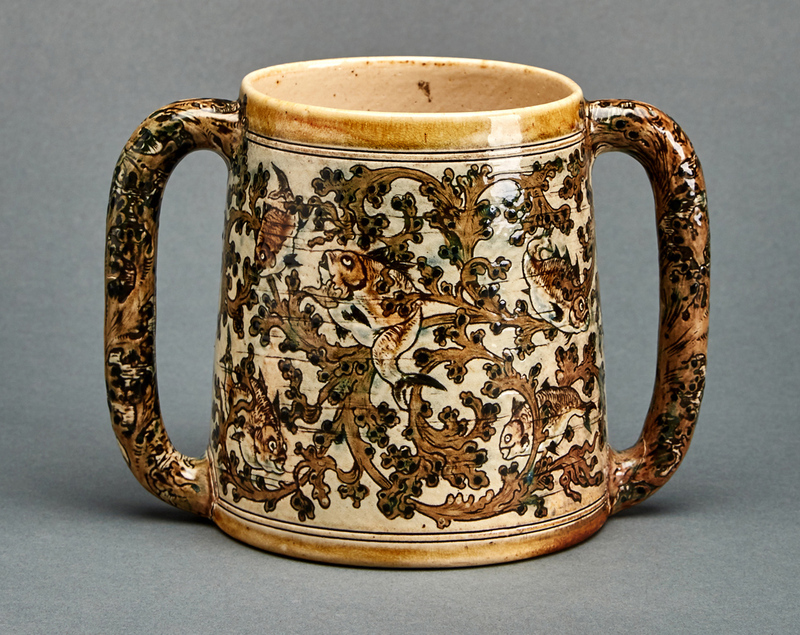 There are three key dates in the modern history of Martinware collecting. 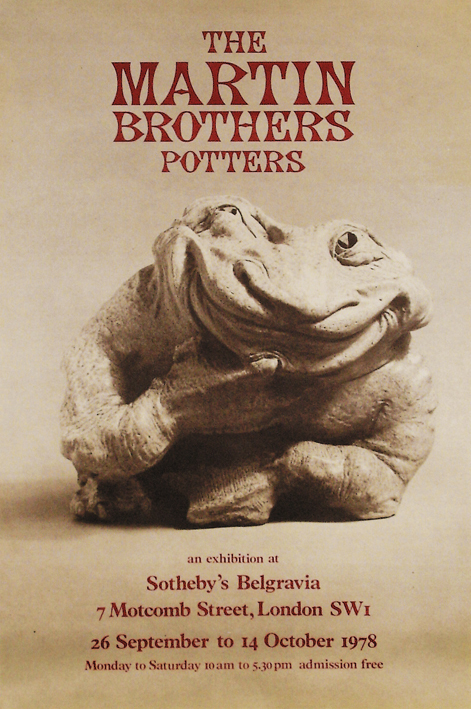 In 1978 British art pottery specialist Richard Dennis put on a landmark exhibition, The Martin Brothers Potters, at Sotheby's Belgravia, showing 719 pieces from miniatures to big birds. 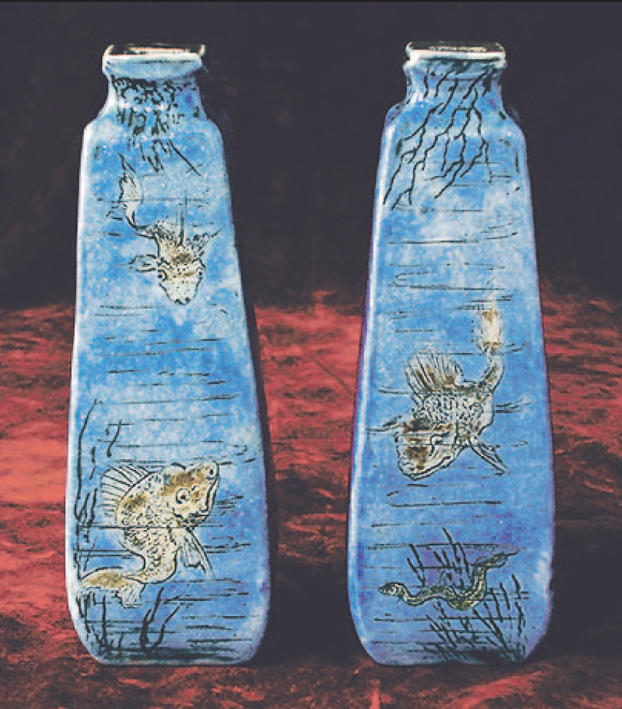 In 1995 David Rago and Phillip Chasen of New York's Gallery 532 put on a show titled The Martin Brothers. The 97 items include the Gladstone and Disraeli birds recently sold by private treaty for £150,000. 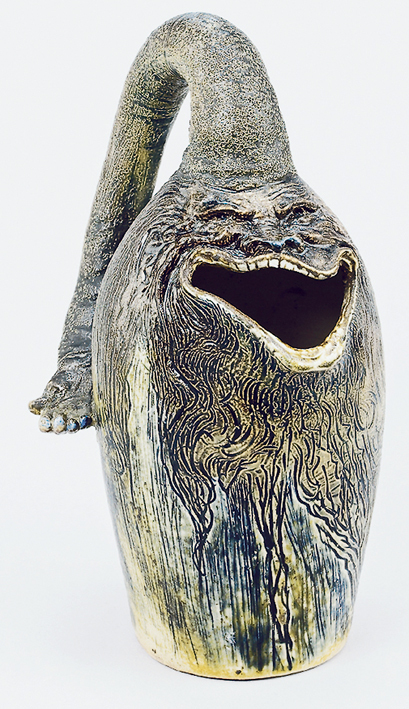 In 2001 Sotheby's New York sold the Harriman Judd collection, an encyclopaedic collection of British art pottery assembled with extraordinary speed by two Californians, Allen Harriman and Edward Judd in the 1970s and '80s. In less than a dozen years their Spanish-style villa in the Hollywood hills was populated by more than 3000 pieces, including a $1m collection of Martin Brothers.